Always plan to apply in a manner most conducive to getting ODORCIDE® Duralast® to the source of the odor. Product works best when applied to a dry surface. This will ensure its ability to penetrate to the odor source. All Duralast® products have the added benefit of Pet-Soothe™. This proprietary feature can help prevent inappropriate marking by relieving the stress and anxiety that accompanies these episodes thus encouraging proper behavior. Benefits can last up to 30 days after application. – Soaking or saturating methods are recommended. – dilute 32 oz. per gallon of water or cleaning solution (1:4). – dilute 16 oz. per gallon of water or cleaning solution (1:8). – add 2-4 oz. per gallon of water or cleaning agent for post spray/secondary Pet-Soothe™ application. For more serious odors use ODORCIDE Original or ODORCIDE Fresh Scent. For hard to remove stains, use ODORCIDE Ox-Erase™. 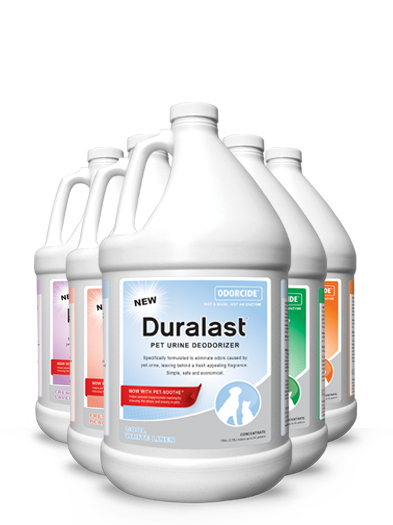 Designed to work in carpet and upholstery cleaning and deodorizing equipment as a pre-spray/soak, in detergent chemical tank, rinse additive and/or post spray.